I remember seeing this book at our local bookstore in early 2000. It had been moved to the "Humour" section. 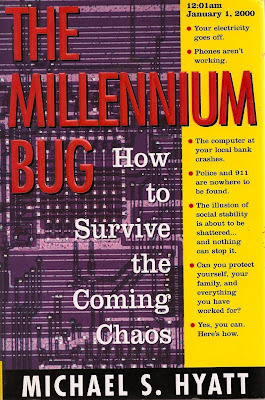 Of course unlike other "end times" predictions, there was a kernel of potential truth to Y2K. Not to the extreme of civilization crashing to a halt, but through the late 90s there were a surprising number of programs that couldn't handle Y2K+ dates. I have a couple friends who did fairly handsomely in 1998 and 1999 reworking code in Silicon Valley. Millions, if not billions were spent on bringing critical software up to date prior to 2000. If that work hadn't been done, we wouldn't be chuckling from the safe side of that moment. Concern, though not hysteria, was justified and real, and we're very lucky that it was taken seriously. Let's do a thought experiment together: it's Jan 1, 1999. I say nothing will happen at y2k, and you say it's potentially a big disaster. People decide to believe you more than me, and make the effort to fix it. Because of that effort, nothing bad happens, and so I'm right, but only because you were right as well. Do you see how this leads us into an arrogant and circular view of history? If not, rinse and repeat. As for 2012, it's only nonsense if nothing happens that fits the prediction, and until then, we know as much as anybody, so I personally throw around the nonsense word with caution. Yeah, I never quite understood what happened with Y2K. I always found the argument "we spent millions and millions of dollars fixing things and nothing happened" kind of odd because isn't that the point of spending the millions and millions of dollars to fix things? The question is whether or not something would have happened if we didn't. I admit I'm not too worried about 2012 through. Unlike the Y2K bug, which is based in something practical that we have legitimate reasons for predicting, the Dec. 21-23, 2012 is based on when the Mayan calendar resets... uh... so what? I know Jack Van Impe has taken that and flown off in his own direction about when Jesus comes back, in direct contravention to what Jesus Himself said. Meh, whatever. Ashamedly I bought into the Y2K concern for a while, that was until I went to a seminar on it and saw right through all the disastrous handling of facts. A woman on this Y2K panel who considered herself an expert had sold her house, was living above a garage and had gathered her "tradable" item for the disaster. Someone asked her if cars, since they don't have date related functions, would fail. Her reply "Yes, because its based on cycles". Huh? Do you know what a cycle is? Oh did I open my eyes at that point. I actually wrote Michael Hyatt an email later who just defended his position, that thanks to his warnings people took heed and curtailed the problem. What the? I worked at Unisys at the time and we had been addressing the problems since around 1990. No, the alarmists caused more trouble then good, people buying generators and medical supplies.. The biggest mistake imho was that us Christians were living based on alarmist theories and neglecting the weightier things. Ironically, Mr. Hyatt blogged more recently about cynics who are pessimistic about the future. He says that real leaders "look on the sunny side." Priceless turnaround. Let me see if I'm getting you. You think it's funny that he has changed. Would it have been less funny if he hadn't? Are you seriously trying to state that you would respect him more if he were still peddling doom and gloom? You do realize that makes no coherent sense at all, don't you? I do confess, the idea of moving the book to the Humor section was a bit of inspired marketing. Anyone remember the Harmonic Convergence of 1987? How we were supposed to transcend to a higher level and such. Maybe it happened and I was just not enlightened enough to know it. Like so many other end of the world predictions, 2012 will come and go and the quarks and conartists will come up with a new date, never fear. My favorite warning from the front cover of the book says that the "illusion of social stability is about to be shattered . . . and nothing can stop it." If this is even remotely true, why buy this book? Does every generation feel so special as to believe they live in the End Times? From my burnout on the Gospel According to Hal Lindsay 30 years ago: YES. Because it Makes ME Very Special. I am The Last Generation. If The End Is Nigh, (Ye Ende is Nighye in Kynge Jaymes Englyshe), The World Ends With ME and Nobody Can Outlive ME. Nothing Can Possibly Outlast ME. This holds for Ends of the World both Religious (Left Behind) and Secular (Global Warming).